Wave Trust is a charity that works to break cycles of family dysfunction and child maltreatment by finding solutions to the root causes of damage. Wave Trust launched a national campaign called 70/30, which aims to reduce child maltreatment in the UK by at least 70% by 2030. 70/30 is a grassroots campaign powered by over 100 Ambassadors who do offline campaigning actions in their spare time to raise awareness of child maltreatment. Their campaigning actions include things like arranging meetings with their local MP, writing press releases, conducting school assemblies, having meetings with members of their local council and CCG. These actions complement the national campaigning that is led by the small team at Wave Trust’s head office. Sara Martínez is the full-time campaign coordinator for the 70/30 campaign. She used to spend half of her time calling, chasing up and emailing ambassadors to find out what they had done so far and briefing them on what to do next. Because she had to spend so much time on stewarding the ambassadors, she barely had the time to do the bigger picture thinking and campaign marketing to make the campaign a national success. Sara needed a way to track the progress of her Ambassadors that didn’t eat up half her week. We proposed that Sara use Makerble to steward her ambassadors. She began using it and hasn’t looked back. Makerble works differently to other stewardship platforms, CRMs, activism tools and supporter databases. 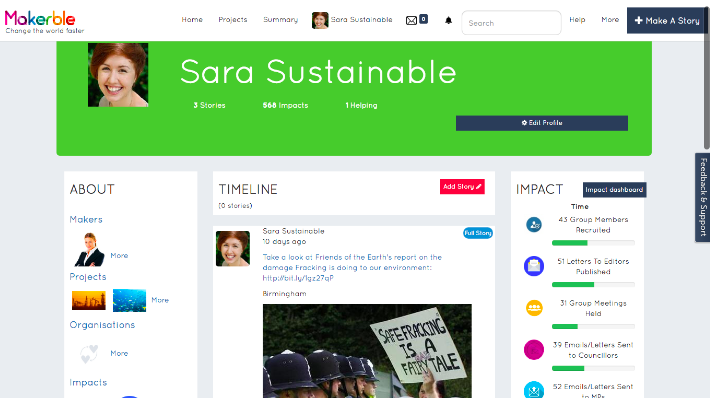 Rather than requiring Sara to spend her time chasing ambassadors for their progress data which she would input into a system, Makerble empowered her Ambassadors to log their personal progress directly. Since Sara started using Makerble, the time she spends on data collection has halved. With her most important resource, her time freed up, she has been able to apply herself to tasks beyond collecting data. And there’s been an additional unexpected benefit. Now that volunteers are logging their own progress, they have become prouder of the difference they are making to the campaign and this has resulted in a doubling in their productivity. They are doing twice as many offline campaigning actions than they were before they started using Makerble. Volunteers are motivated to do more as ambassadors because the Makerble Impact Tracker offers lovely transparency. Secondly, volunteers are genuinely proud - Makerble’s visuals capture their impact and showcase the wonderful things they’re achieving. Ultimately, empowering everyone ... meaning everyone won! Sara mentioned her manager was absolutely thrilled with Makerble! The team really loved the export function. Collecting information for reports or meetings has never been easier! 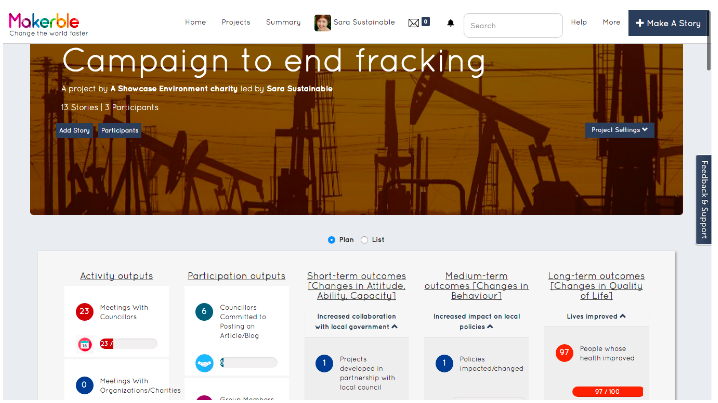 She went on to say “We have data on a really visual, comprehensive way presented to us, it’s just so much easier to talk about how we’re getting on as a network and what we’re achieving.” This is also great for journalists, donors, investors and other stakeholders!